My first alpine summit since the accident. On 21 July 2013 this race almost claimed my life. Only one year later, this was my biggest victory! Focus on the possible. Not the impossible. And it will take you beyond where you are. On 21 July 2013 I was given a 2nd chance at life, but told I would never be able to ride a bike again. God has been good to me. 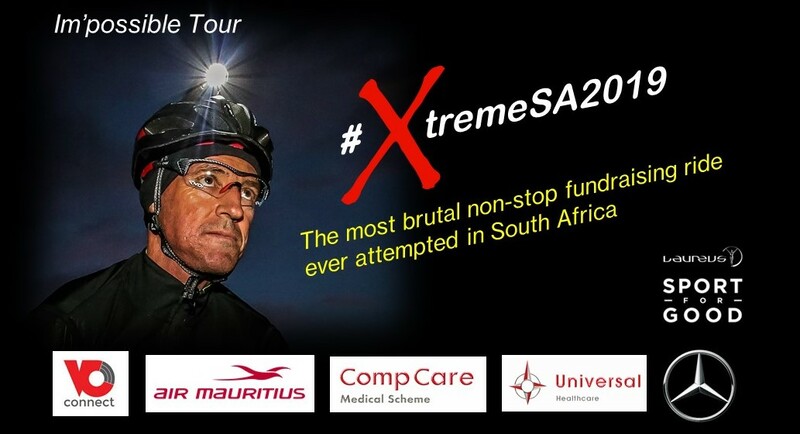 Ultra-Endurance Cyclist and Laureus Sport for Good Ambassador, Grant Lottering’s remarkable comeback from death on 21 July 2013 to conquering the Alps, continues to astonish the medical profession and audiences alike. In August 2016, Grant became the first cyclist to complete a solo, non-stop, 1 000km ride through the French Alps in under 50 hours. On 1 September 2018 he undertook his 5th Im’possible Tour in aid of Laureus, cycling the length of the French Pyrenees and Alps non-stop in less than 72 hours, another world first. He covered 23 mountains and climbed a vertical height of 21,484m, while only sleeping for 3 hours and 40 minutes during his attempt. Described as astonishing and remarkable, he succeeded in spite undergoing 2 shoulder surgeries as recent as February 2018. What makes his accomplishments so remarkable, is that he has undergone 10 surgeries 2013 – 2018 as a result of his accident. In addition he had to overcome emergency cancer surgery late in 2016. His remarkable story of survival and overcoming has attracted much media attention, locally and world-wide, reaching over 20 million people through broadcast, print and online media. He has shared his story ’From Death to the Top of the Alps‘ with audiences in over 11 countries around the world. Inspiring audiences to change the way they think about themselves, persevering in the face of challenges and being mentally strong to achieve levels of success never thought possible. Grant Lottering has overcome incredible odds, refusing to give up, and continues to do what most believe to be impossible. If your business has aggressive growth plans, needs to reinvent, or your employees need inspiration for the remainder of the year, their thinking needs to change. In 4 years Grant’s life went from death to completely reinventing himself, breaking records, achieving the impossible and turning tragedy into a multi million international fundraising project. Book Grant today to inspire your teams to change the way they think about themselves and their contribution to your business through his remarkable and real-life story. The story ‘From death to the top of the Alps’ Let it inspire you and your employees to stay in the game, no matter how many times you get knocked down.